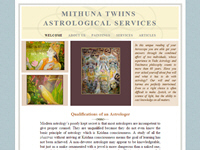 The official website of Mithuna Twins Astrological Services. It is run by two famous devotee astrologers – Patita Pavan das Adhikary and Abhaya Mudra Dasi. Category Astrology July 12, 2012 by ISKCON Desire Tree.